WOW! You get 13 pieces in this faux painting combo set with FREE Priority Shipping. Includes 2 jars - each 7.2 ounces of Zero VOC paint colors used on DVD demonstration (golden and brown colors). You get enough paint and glaze to faux paint an entire living and dining room. 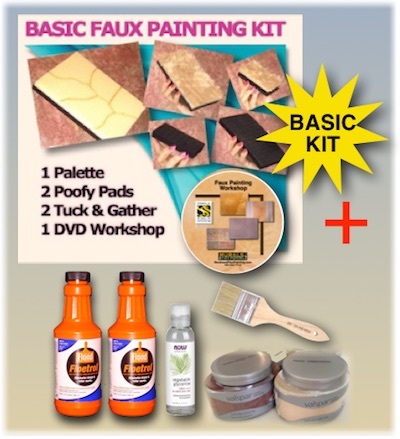 Patented (#7472450) Faux System - Workshop teaches you 10 different faux finishes. Includes Multi Color Faux Palette, 2 Poofy Pads and 2 Tuck and Gather tools. Floetrol is a paint conditioner that we use as a glaze. It can be mixed with regular wall paint as well as acrylic craft bottled paint. Two quarts will allow you to faux paint an entire living and dining room. You can purchase a gallon later from Home Depot or Lowes for larger projects. We have chosen 2 of the most popular EnviroSafe paint colors for the Old World Parchment faux finish. Enough to mix with glaze to faux paint an entire living and dining room. We sell other colors of EnviroSafe paints in quarts if you want to have them drop shipped to your home or you can buy a similar color from paint store. These colors are named on the FREE Color Suggestions Idea E-Book that is included with this combo kit. Open time refers to the time you have before glaze mix dries. Add one part glycerine to 6 parts of Floetrol to get more open time. This is the perfect brush for blending sections where you can't fit Poofy Pad. Carry your chip brush, wet cloth and small poofy pad in this tool belt. Adjusts to any waist size, too. Take the guess work out of choosing colors. You will receive the E-Book in an email after your order is shipped.